Entities (animata) are not possessable but can be connected to other entities by the connecting particle te. Only entities can be connected to eachother. Connection entails that the parties are of equal status. The leftmost word of a connection can be dropped, and is then understood to implicitly mark 1st person connectee, number unmarked. As examples 2b) and c) shows, te can take on all shared affixes. Only inanimate nouns can be alienably possessed, and these are suffixed with -eð. Possessive pronouns are only used with alienable possessees. The table of possessed pronouns is somewhat simple, since inanimate nouns cannot normally be any other person than third. Leftmost is the derived pronoun, rightmost is the fused, high register pronoun, if any. Since there is no ambiguity and both words are marked for the same case, they can come in any order, anywhere in the clause as usual. Examples 5c) to f) shows a stative modifying the pronouns: the possessee in c) and d), and the possessor in e) and f). Examples c) and e) shows implicit agreement while d) and f) shows explicit agreement. Example 5g) is a less clumsy variant of 5e) and f). Inalienable possession is for things that cannot change possessor. Your arm is still your arm even if it has been amputated and is in a display-case, and a real arm in a display-case once was part of someone even if that someone is long dead. Assuming that time travel cannot change the past, but only fork off a new parallell reality, then your blood relatives will always remain your blood relatives. The possessor and possessee are combined into a compound. When the possessor is a noun, the particle jï binds the possessor and possessee into the compound. It should be noted that in example 6), the stress can never be moved further left than the jï. In fact, stress will be on the jï if the possessee is a one-syllable word or contains no long syllables. In some dialects the possessee will have a secondary stress in the usual position if longer than two syllables, this is known as weak jï (actually little jï), vüjïvun. It is not so that there must be an explicit possessor. It is always understood that there is something or someone that the possessee belongs to. "I/we wash my/our (own) hands"
"He/she washes his/her (own) hands"
"He/she washes somebody elses hands"
"My younger sibling doesn't want to wash his/her (own) hands"
If the possessee is not the subject, the implicit owner is the subject, as is the case in all of example 8 but c) above. If the possessee is a subject, the owner is the speaker, and thus in most cases 1st person, as in example 8d). 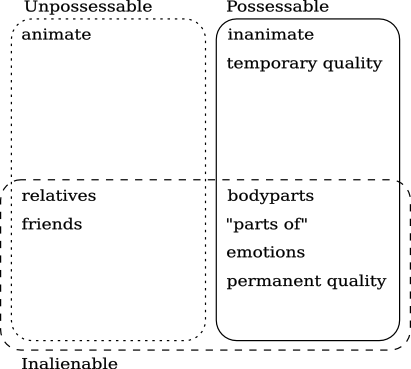 Because possessor and possessee are compounded, something interesting happens: which of the two stems are affected by affixing, adjectives etc.? "the heads of all the small parents"
"the parent's HEAD, as opposed to something else"
"none of the big good hands of all of the wild tourists"
Note that in example 9a) how the plural-marker chosen is the paucal/quintal and not the generic plural. This is because the generic plural strongly implies alienability. By using the generic plural instead, one would imply that the small heads of the parents are no longer connected to their respective necks. In example 9b) it is the possessor that is affected. In this particular case using -ðe means basically the same thing as using the paucal/quintal, and using -ðe was a stylistic choice, preventing a double dose of Cn-rhymes and serving as an example of disharmony. Example 9c) shows that all prefixes on the compound affects the the head of the compound. This does mean that if it is necessary to emphasize or otherwise prefix the possessor, it is not possible to use an inalienability-construction. Instead one must use one of the two other strategies: if the possessee is animate, with te, if not, with -eð. This is also the case with standalone adjectives, as shown in the last to final example, 9d). To sum up: the jï connects two core nouns, and not two bare nouns. "the eye of the head of the tourist"
"the tourist with the dog with the cat"
"the color of the car of the tourist"